Miss Posh Life™: Posh Style: Paris Vintage w/ side of Fleas! Posh Style: Paris Vintage w/ side of Fleas! I have a confession. I am not the most prolific vintage shopper. Gasp. Something about the digging, dust and smell is a bit of a turnoff for me. It requires the right mood and proper dedication. However, huge exceptions were made in Paris. I mean it's Paris. I made friends with a few vintage stores & scored errr ummm an Hermes scarf AND a vintage fur coat (ask me where I am wearing it. Hell if I know. More on that later). So posh though. 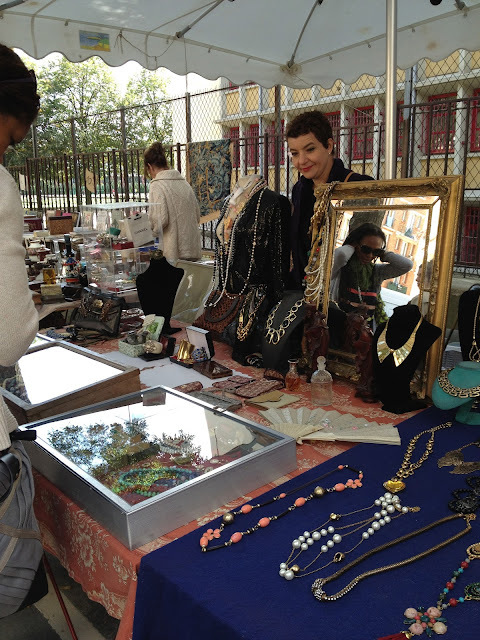 A trip to Vanves flea market (in the 14th I believe) produced a vintage python leather clutch, old french papers and postcards that I will frame and gorgeous antique jewelry pieces NOT to be seen anywhere else on anyone else. Yay. Officially a fan. Well at least in Paris. Stay Posh! Apparently a lot of vintage Chanel ladies..but alas I missed it. Posh Style! Details Details "In the Bag"